2015 Best Apartment Management Company – Sonshine Management Systems, Inc.
Voting for Best of the Pee Dee 2015 was open from May 3rd through May 18th. We are proud to announce that Sonshine Management Systems has won in the Real Estate category ‘Best Apartment Management‘ for 2015. Wow, we are honored to be voted the Best Apartment Management company in the Florence, SC and surrounding area for 2015. That is two years in a row we have won this award! We hope to make it three in a row next year in 2016. 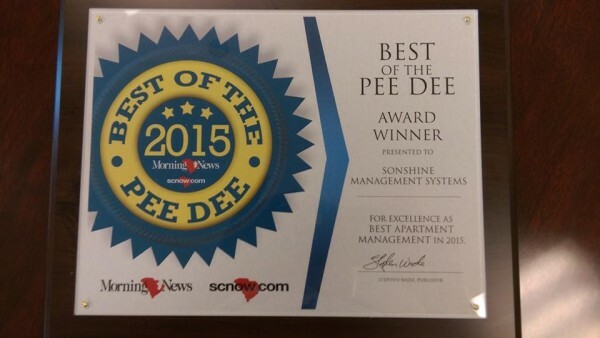 Thank you for voting for us and thanks to the Morning News and scnow.com for continuing to have the ‘Best of the Pee Dee’ contest each year. It is an excellent way customers can voice their opinion on who is best in each category. We were up against some pretty tough competition but we are glad and humbled that we came out on top. Each and every day, we do our best to meet all owner’s expectations for their properties while at the same time providing a high level of customer service and support for all residents of those properties so they feel more ‘at home’. We think we are pretty good at this and hope you agree. If you have any comments or questions or if you have rental property or a homeowners association in need of management, please feel free to contact us. We’d love to hear from you! Your property will be in good hands with Sonshine Management. We look forward to serving you for the next year and beyond and also look forward to defending our best apartment management title in 2016. Thanks again to all who voted. CLICK HERE to see the 2015 results for this category. If you have landed on this page looking for apartments for rent in Florence, SC please look on our apartments for rent page for our latest listings. We also offer condos for rent, houses for rent and townhouses for rent in the Florence, SC and surrounding areas!